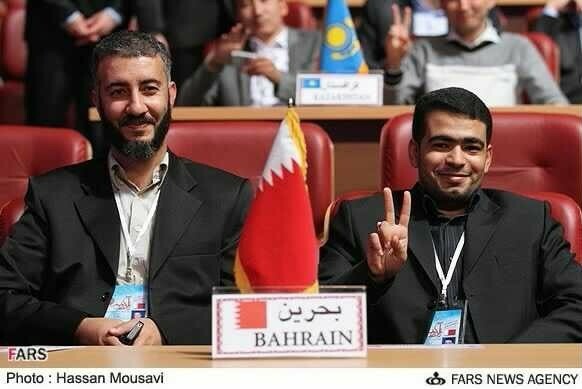 Religion and Politics in Bahrain: Are Bahrain's Sunnis Still Awake? 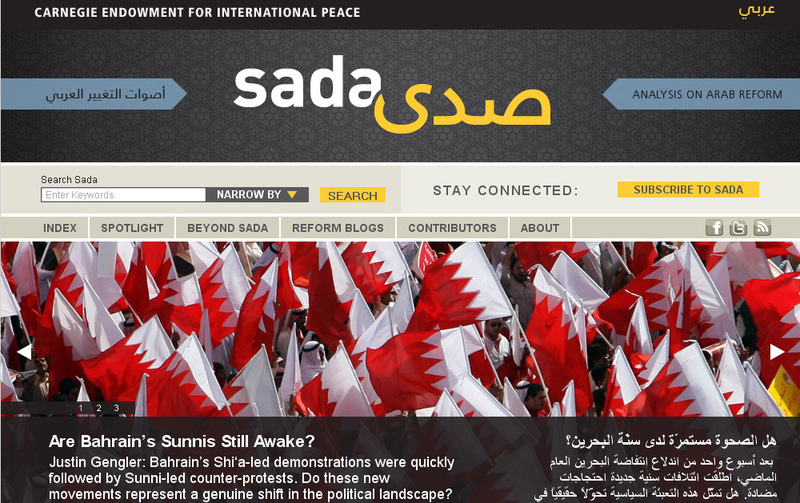 Are Bahrain's Sunnis Still Awake? In case you couldn't tell from the huge graphic, I have a new article in Carnegie's Sada blog that revisits the subject of Bahrain's "Sunni awakening," which I wrote about in January. In short, the piece tells why we may soon finally learn the nature of the country's post-February Sunni movements--specifically, the National Unity Gathering and the al-Fatih Awakening--as a result of a (rumored) new push for government-opposition dialogue. Yet, whether or not one believes that fresh talks are imminent (a prospect made perhaps more faint following 'Ali Salman's being shot on Friday and the king's cabinet speech yesterday), the larger point remains: only if Bahrain's new Sunni groups remain insistent upon a seat at the political negotiating table--as they were in March--can we conclude that they represent something new and independent of the state. And it is only this insistence, moreover, that can bring to bear the pressure required to push Bahrain toward genuine political change. The full article is here. The Arabic version is here. Update: Sunni internet forums are abuzz with news of the re-arrest of Muhammad Al Bu Flasa, the Salafi former army officer made famous for his address at the late Pearl Roundabout at which he urged sectarian political cooperation. Yesterday's detention stemmed reportedly from a "family dispute" relating to his political activities. Apparently his wife's family is not a huge supporter of the Sunni awakening. Khalifa bin Salman: "I wish you to rid me of all the Baharna!" Genie: "Man, I told you! 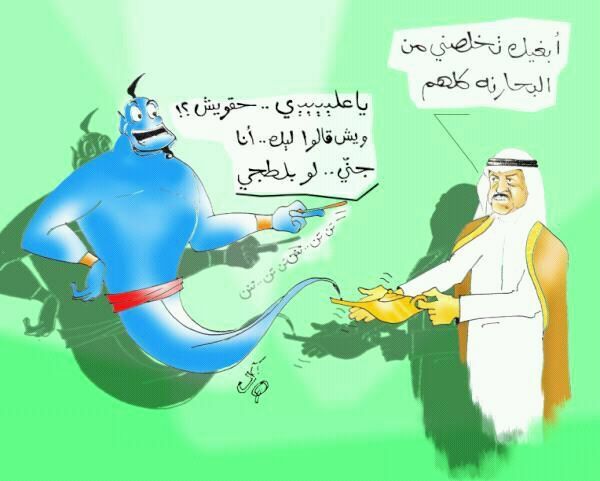 I'm a genie not a government thug [baltaji]! Update 3: Emile Nakhleh: "Bahrain Repression Belies Government Stand on Dialogue." Update 4: I've just come across the website of the National Unity Gathering, which judging by pro-government forum comments must be fairly new. For those interested, it includes sections detailing the groups "Principles," "Aims," "Political Platform," and so on. Khalifa bin Salman: "I want you to get rid of all the Baharna!" Genie: "Dude, what?! Who did they tell you [I am]?! I'm a genie, not a [government] thug!" Thanks, I was trying to fit them both on one line. The Genuie also said Yaaaaaaaaaaaaa 3li which is used by Bahraina which = WHAT? The End of "Bahraini Hizballah"?